One of the most beautiful valley in the European alps is the Pinzgau valley. The mountain Wildkogel, where we are actually standing on is a huge skiing resort in winter and a big hiking area in the summer. Reachable with a rope way the top of the wildkogel is always in range for all outdoor activity. This particular view is from the northern side of the wildkogel to the main part of the alps, the "Alpenhauptkamm". In the foreground an artist created a huge snow man. 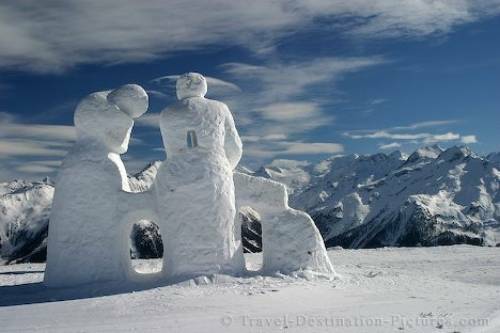 Picture of a snow sculpture piece of art in the mountainous wilderness of Austria, Europe.